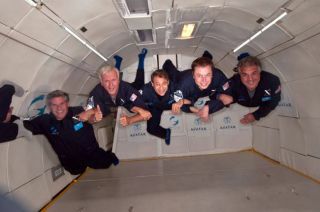 "Avatar" Director/Producer James Cameron floats weightless in Zero-G along with X PRIZE Trustees in a flight to raise funds for the X PRIZE Foundation. Left to right: Rob McEwen (Chairman, US Gold), James Cameron, Peter H. Diamandis (Chairman/CEO, X PRIZE), Elon Musk (Chairman/CEO, SpaceX), Jim Gianopulos (Chairman/CEO, Fox Filmed Entertainment). Full story. Academy Award-winning director James Cameron is putting his star power behind the X Prize Foundation, a non-profit group that aims to solve global challenges by stimulating research via prestigious prize competitions. The foundation announced this week that the Hollywood director has been appointed to its Board of Trustees. "I am excited to have James Cameron joining our board," Peter Diamandis, the foundation's chairman, CEO and co-founder, said in a March 15 statement. "He's committed to envisioning and creating the future and does not take 'impossible' as an answer to solving the world's grand challenges." Cameron joins a growing list of entrepreneurs, scientists and engineers on the board, including inventor Dean Kamen, SpaceX and Tesla CEO Elon Musk, Google co-founder and CEO Larry Page, President and Editor-in-Chief of Huffington Post Media Group Arianna Huffington, and Anousheh Ansari, the first female private space explorer. The board advises the foundation on where high-stakes competition can drive radical breakthroughs in technology. The organization itself seeks to motivate innovators from all disciplines to leverage their intellectual and financial capital for the benefit of humanity, X Prize officials said. "Capturing the public's imagination is a key component of all critical exploration these days. We especially have to engage kids and the X Prize Foundation certainly does it," Cameron said. "They really promote innovation and exploration in key areas and I'm honored to participate in the development of its initiatives." Cameron's work as a film director, producer and screenwriter includes titles such as Avatar, Titanic, Terminator and Aliens. Cameron also spent years creating documentary films and co-developing the digital 3-D Fusion Camera System. He has contributed to the development of state of the art underwater cinematography, 3-D imagery for NASA missions to Mars, and remotely piloted vehicle technologies. In addition to his appointment to the Board of Trustees, Cameron serves on the X Prize Foundation's Exploration Advisory Committee. The X Prize Foundation was founded in 1995. The organization manages competitions in four prize groups: education & global development; energy & environment; life sciences; and exploration (ocean and deep space).